Getting ready for the Fourth of July? It's on everybody's mind, but even more important is preparing to hear the Word this Sunday at Mass. Make some time before you go to Church this weekend to read over the Scriptures you'll hear proclaimed at Mass. The Gospel selection from St. Matthew encourages us to take Christ's yoke. Last year at this time, Father Garrett preached and to illustrate he asked if anyone had seen a yoke. Amazingly, not a single "New Yorker" had ever set their eyes on a yolk. 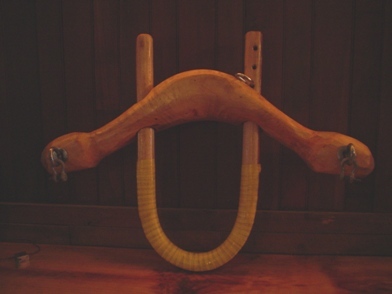 To our amazement he produced a "home-made" yoke and had two student demontrate its use. “Come to me, all you who labor and are burdened,and I will give you rest.
" Christ’s yoke is identical with his friendship. It is a yoke of friendship and therefore “a sweet yoke”, but as such it is also a demanding yoke, one that forms us. It is the yoke of his will, which is a will of truth and love. For us, then, it is first and foremost the yoke of leading others to friendship with Christ and being available to others, caring for them as shepherds." Jesus' yoke--though "easy" and the burden "light"--nonetheless gives us direction and purpose for our lives. We no longer need to create and re-create ourselves--we are now being gently re-sculpted into Christ's likeness." There is freedom in being yoked to a single focus and direction through Christ. Ever notice how those who have genuinely yoked their lives to Jesus don't seem to think they are "missing out" on anything? The perfect freedom and fulfillment that come from a life lived in Jesus' "rest" allow disciples of Christ to look down all life's other torturously twisting side roads, speed traps and dead-end routes and affirm with a shake of our heads--"no thanks--been there, done that." 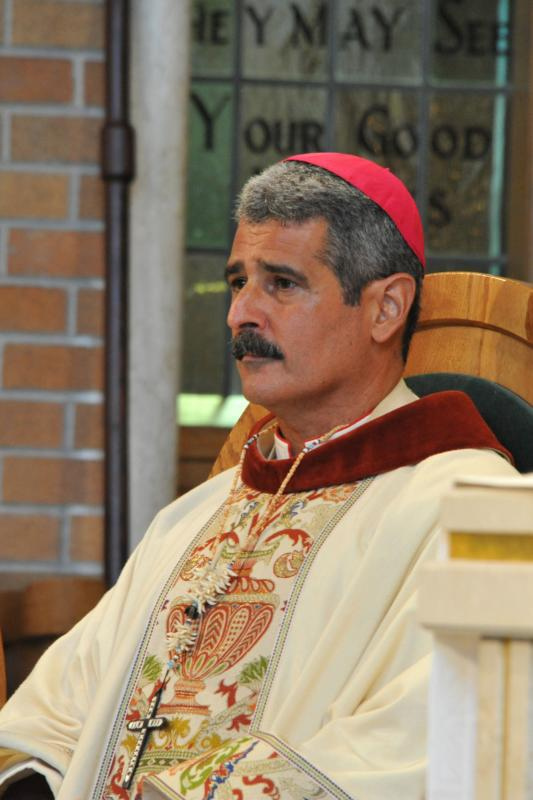 Yesterday on the Solemnity of the Body of Blood of Christ we gathered to celebrate the Silver Jubilee of Priesthood of Bishop Chris Cardone, O.P. at St. Raymond's Church in East Rockaway. Together we rejoiced at his 25 years of priesthood and 10 years of shepherding the Church in the Solomon Islands. The Marianist of the Province of Meribah have assisted in the missionary efforts with Bishop Chris for many years training the teachers of his Diocese. It is a very fitting solemnity to celebrate such an occasion. 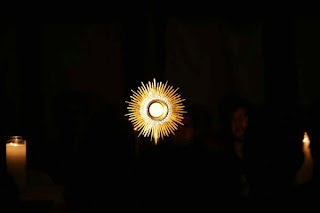 This is the feast where we attempt to understand and explore the belief that Christ is truly present in the Eucharist. 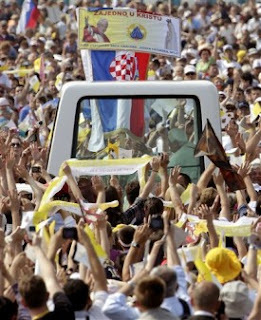 There comes also a challenge, to believe not only that the bread and wine become the body and blood of Christ, but to believe also that, indeed, we are to become what we eat and drink: we are to become the true presence of Christ breaking ourselves like bread to nourish our neighbor; pouring ourselves out like wine in outreach to those in need. And the chalice, or what is in the chalice, how is it His Blood? 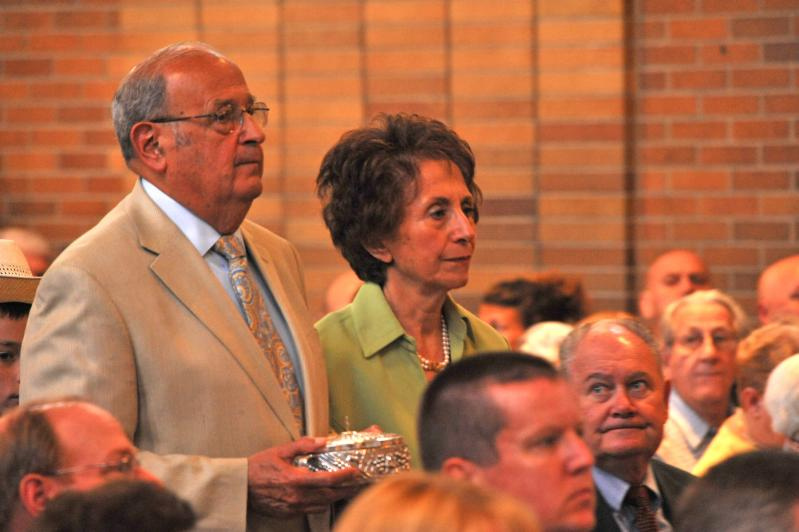 Nuzio and Ann Cardone presented the Offertory gifts. you receive your mystery. To that which you are, you answer: `Amen...' For you hear: `The Body of Christ!' and you answer: `Amen!' Be, then, a member of Christ's Body, so that your `Amen' may be the truth." 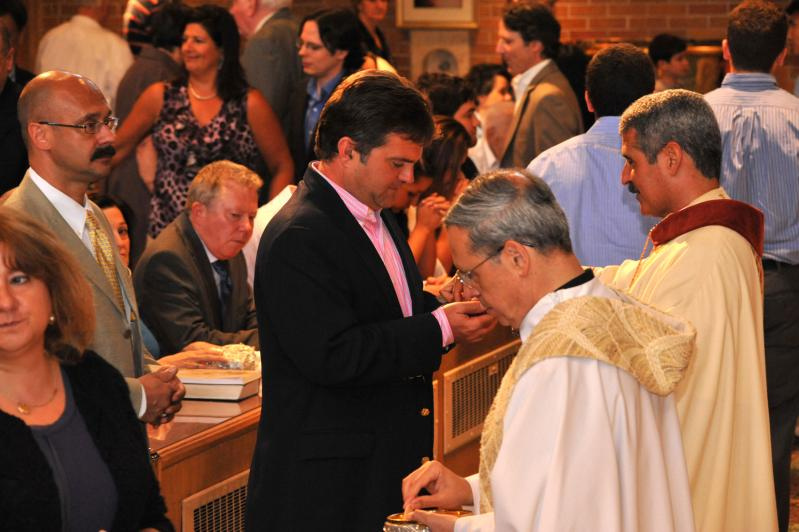 Bishop Chris and Father Thomas distribute Holy Communion. Life-long friends of Bishop Chris, the McCarthy's. St. Raymond's Choirs provided inspirational music. You have to see this on this Corpus Christi weekend. In February, two Franciscan Capuchins held a Eucharistic Adoration Flash Mob in front of a busy mall in Preston, UK. They read out a powerful list of Jesus's atttributes in each book of the Bible and then call passers-by to "Come and Kneel Before Him Now". And slowly, one by one, they do. Then they begin to clap before him. "What is this about? What is happening? What is this about?" One young girl said: "I've not seen anything like this since Church." "Are they doing this all day? ... Will they be doing it again? ... Are they doing this any where else?" Two young women asked: "Why does God allow hurt and pain in the world?" They agreed it was not God's fault but ours. Then they asked: "Why doesn't Jesus come again?" We explained that He is here in the form of bread, but would come again and we invited them to think about Him now. "Is it religious? What is inside that thing?" A man said: "What is that guy doing?" An old woman with him replied: "That's Jesus. Show respect." "This is so moving! It is the first time I have seen it done outside. I can't wait to tell my parish priest!" The Capuchin Friars, Brs Mark, Prins & John, return to Preston after 467 years, following the Dissolution of the Monasteries in 1539, to take responsibility for the Catholic Chaplaincy at the University of central Lancashire. The new Chaplaincy is on the site of the Leper Hospital of St. Mary Magdalen, founded c.1177. In about 1525 the hospital was transferred to the Franciscan Friars who left at the Dissolution in 1539. It seems that the Franciscans aren't going to wait for students to come to them. It puts a new twist on the popular (if never said by St. Francis) adage: "Preach the Gospel at all times. If necessary, use words." I found the website of their Catholic Chaplaincy and noticed something really interesting. Adoration every morning and evening, M-F, and on Saturday & Sunday mornings. And - and this is the first time I have ever seen this in a Catholic setting - a "seeker service" at 11 am on Sunday (described as a "special Mass" for those seeking God). I have no idea how that would vary from a standard parish Mass but it is very interesting. Obviously this community has a deeply missional focus. The Solemnity of the Most Holy Body and Blood of the Lord, or Corpus Christi, celebrates the Eucharist in more focused way than Holy Thursday. It was established by Pope Urban IV in 1264 and its Mass composed by St. Thomas Aquinas. In anticipation of the universal feast, in 1246 the Bishop of Liège in Belgium, had instituted a feast for the Eucharist at the request of an Augustinian nun and mystic St. Juliana of Cornillon. 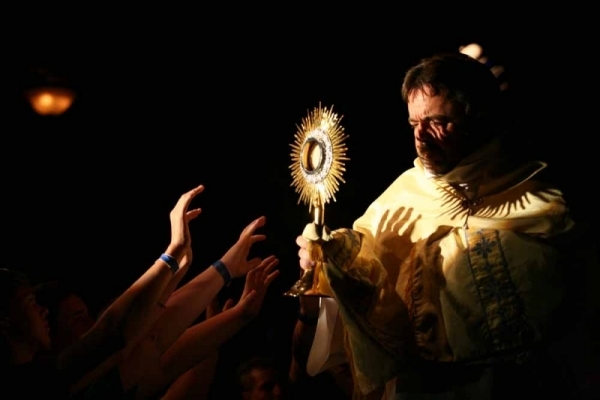 The feast of Corpus Christi was inspired by a great miracle. In 1263 a German priest, Peter of Prague, stopped at Bolsena in Italy on his way to Rome. 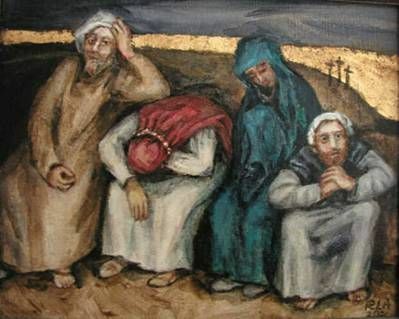 He had doubts about the Real Presence of Christ in the Host. At the tomb of the virgin martyr St. Christina, Peter celebrated Mass. At the consecration blood began to drip from the Host. It bled over his hands onto the linen corporal spread upon the altar. Fr. Peter stopped the Mass and asked to be taken to Pope Urban in nearby Orvieto where he was in residence with his court. St. Bonaventure and St. Thomas were also there. 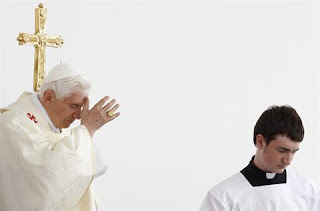 The Pope listened to the priest’s account and began a complete investigation. Urban ordered the bishop of the diocese to bring to Orvieto both the Host and the stained linen corporal. The Pope made a great procession with the entire papal court out of Orvieto to meet the other procession approaching with the Host and corporal. St. Julianna urged Pope Urban to institute a universal feast and Aquinas, inspired by the Augustinian mystic, drafted an Office and Mass for the new feast day. The relics are still venerated in the great cathedral or “Duomo” of Orvieto which was built for their display, the cornerstone having been laid in 1290. The cathedral and the gold reliquary are wonders of medieval period. "Thank you, Lord Jesus! Thank you for your loyalty, which sustains our hope. Stay with us, because the evening comes. "Jesus, good shepherd and true bread, have mercy on us; feed us and guard us. Grant that we find happiness in the land of the living". Amen." Christ is present in the sacramental supper of the table where we are nourished by the sacrifice he offered on the altar of the Cross. But what do we mean when we say that? And that which is in the chalice - how is it his Blood? because in them one thing is seen, but another is understood. You yourselves are the Body of Christ and his members. so that your `Amen' may be the truth. In St. Augustine’s effort to help us understand the comfort that is ours in believing that Christ is truly present in the Eucharist, there comes also a challenge, to believe not only that the bread and wine become the body and blood of Christ, but to believe also that, indeed, we are to become what we eat and drink: we are to become the true presence of Christ breaking ourselves like bread to nourish our neighbor; pouring ourselves out like wine in outreach to those in need. This Sunday we celebrate the great feast of transubstantiation. The Catholic Church teaches that in the Eucharist, that little wafer and that cup of wine really become the body and blood of Jesus Christ. I am sure you have met someone who finds this a bit hard to take? It was in the Middle Ages that theologians tried to explain how Christ’s body and blood became present in the Eucharist. After a few theologians got it wrong, St. Thomas Aquinas came along and offered an explanation that became classic. In all change that we normally observe, St.Thomas teaches, appearances change, but deep down, the essence of a thing stays the same. For example: if, in a fit of mid-life crisis, a father traded his mini-van for a Ferrari, abandoned his wife and kids to be a tanned beach bum, bleached and spiked his hair, buffed up at the gym, and made a trip to the plastic surgeon, he would look a lot different. But for all his trouble, deep down he would still substantially be the same confused, middle-aged dude as when he started. The first two readings this weekend (from Exodus and Hebrews) focus our attention on a covenant made in blood. There is reference to the sacrifice of animals and to the new covenant made in the blood of Christ. The Gospel for this weekend is Mark's account of Jesus sending his disciples to prepare for the supper on the night before he died and the account of his words and actions at table on that holy night. Pope Benedict sees the world regaining joy by participating in love—both giving and receiving. 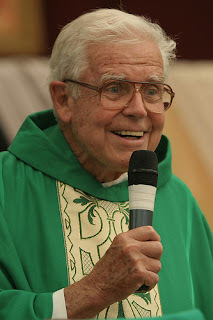 He invites modern man to rediscover his lofty vocation as a beloved child of God, for "one cannot become wholly man in any other way than by being loved, by letting oneself be loved." 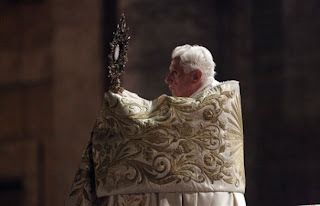 This divine love cannot be a noble fiction meant to keep us from despair; as Benedict writes, "Only when love and truth are in harmony can man know joy." Our Community homily yesterday asked us the very same question, "Are you happy?" A good question. "Are you happy with your life?" "Are you happy with your family?" "Are you happy with what you do day in and day out?" "Are you happy inside my own skin? These are solid questions to ask ourselves? But Father Albert took a different look at those questions. He challenged us saying they're questions with which to torture ourselves. He quoted, "When we face our lives honestly this kind of question about happiness is more likely to bring tears to our eyes than solace to our souls because, no matter how well our lives are going, none of us live perfectly fulfilled lives. Always there are unfulfilled dreams. Always there are areas of frustration. Always there are tensions. Always there are deeper hungers that are being stifled. And always, as Karl Rahner so poignantly puts it, we are suffering the torment of the insufficiency of everything attainable as we are learning that here in this life there is no finished symphony. Are lives are always lived in quiet desperation. A lot of times it is not easy to feel happy. But we are asking the wrong questions. The question should not be: Am I happy? Rather the questions should be: Is my life meaningful? Is there meaning in my life? Is there meaning in my marriage? Is there meaning in my family? Is there meaning in my job? Is there meaning inside my church? We need to ask the deep questions about our lives in terms of meaning rather than in terms of happiness because, for the most part, we have a false, over-idealized, and unrealistic concept of happiness. We tend to equate happiness with two things, pleasure and lack of tension. Hence we fantasize that for us to be happy we would need to be in a situation within which we would be free of all the tensions that normally flood into our lives from: pressure, tiredness, interpersonal friction, physical pain, financial worry, disappointment in our jobs, frustration with our churches, frustration with our favorite sports teams, and every other headache and heartache that can appear. Happiness, as it is superficially conceived of, means perfect health, perfectly fulfilled relationships, a perfect job, no anxiety or tension in life, no disappointments, and the time and money to enjoy the good life. But that isn't what constitutes happiness. Meaning is what constitutes happiness and meaning isn't contingent upon pain and tension being absent from our lives: Imagine if someone had come up to Jesus as he was dying on the cross and asked him the question: Are you happy up there? His answer, I am sure, would have been unequivocal: "No! And today in particular I am not happy!" However, the perspective is quite different if, while on the cross, Jesus would have been asked this question: "Is there meaning in what you are doing up there?" There can be deep meaning in something even if there isn't happiness in the way we superficially conceive of that. We more easily grasp this when we reflect back on various periods of our lives. Looking back, from the perspective of where we are today, we see that sometimes certain periods of our lives that were fraught with all kinds of struggles and within which had to make do with very little were indeed very happy times. We look back on them now with fondness and warmth. 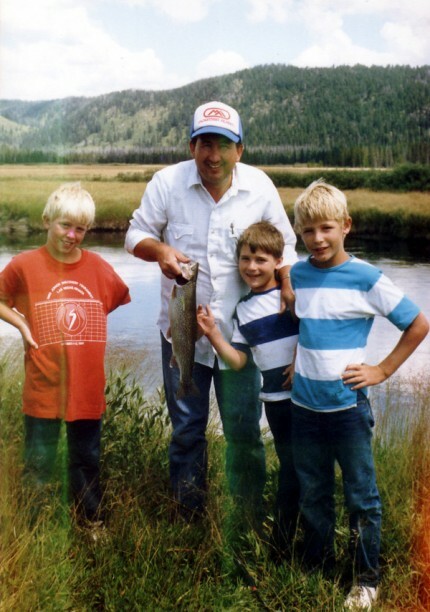 They were meaningful times and our present perspective washes back through time and purges the pain and highlights the joy. Conversely, we can also look back on certain periods of our lives when there may have been pleasure in our lives but that phase of our lives now appears clearly as an unhappy time. We look back at it with a certain heaviness and regret. What seemed like light then seems like a time of darkness now. C.S. Lewis taught that happiness and unhappiness color backwards: If our lives end up happy, we realize that we have always been happy even through the trying times, just as if our lives end up unhappy we realize that we have always been unhappy, even during the pleasurable periods of our lives. Where we end up ultimately in terms of meaning will determine whether our lives have been happy or unhappy. Many people, including Jesus, suffered great pain but lived happy lives. Sadly, the reverse is also true. Happiness has a lot more to do with meaning than with pleasure. In his autobiography, Surprised by Joy, C. S. Lewis tells his readers that his journey to Christianity was not an easy one. By his own admission, he was "the most reluctant convert in the history of Christendom." But one of the things that ultimately brought him around to the Christianity was precisely the realization that meaning trumps our normal conception of happiness. He came to understand, he writes, that the harshness of God is kinder than the softness of man and God's compulsion is our liberation. Money can't buy happiness. It can buy pleasure, but, as life itself eventually teaches us, pleasure is not necessarily happiness." This 12 minute plus video is worth watching…for all those days you might wake up and feel overwhelmed by the challenges ahead, or when you wonder if your dreams can ever be achieved. DJ Gregory had a goal and went after it… and his story is truly inspirational. 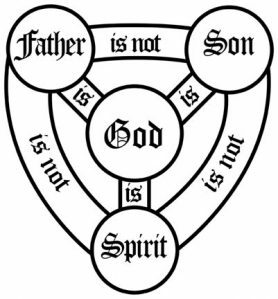 The Catechism of the Catholic Church teaches us that "The mystery of the Most Holy Trinity is the central mystery of the Christian faith and of Christian life" (CCC 234). This is because we are created in the image and likeness of God, as Scripture tells us. Therefore, if God's essential nature is love, so is ours! We have a built in openness to other people. We are incomplete by ourselves. We are created to give ourselves to others and to receive others. 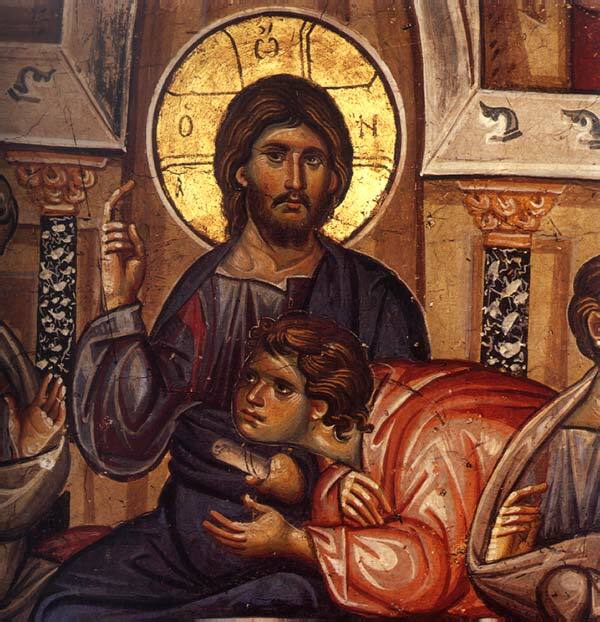 The Father, from all Eternity, loves the Son and pours himself into the Son, and the Son loves the Father in return. And that mutual love is so complete that the Holy Spirit proceeds from it. Every human family is an image of this Trinitarian love. This mysterious and wonderful doctrine about God, that he is both unity and trinity, is called by the Catechism "the central mystery of Christian faith and life" (CCC). It is the center of our faith, because it gives us a glimpse into the inner life of God himself, the God we believe in. And it's the center of our life, because we are called to be living images of God, created to love and be loved. Jesus gave his Church the great commandment to "love one another as I have loved you." He did not command us to make millions of dollars. He did not command us to win awards and prizes. He did not command us to be comfortable. He commanded us to be like him: to love God with all our heart and to love our neighbor as ourselves. And loving God leads automatically to loving our neighbor. 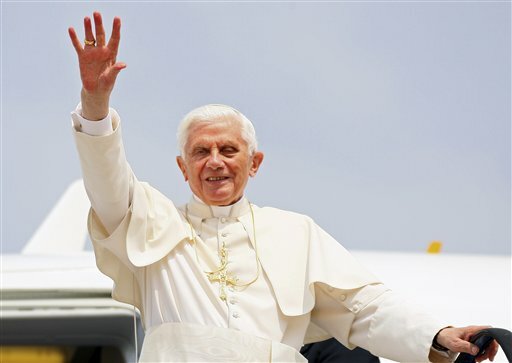 Pope Benedict wrote in his first encyclical: "In the saints one thing becomes clear: those who draw near to God do not withdraw from men, but rather become truly close to them" (Deus Caritas Est, 42). This Sunday we celebrate the Solemnity of the Most Holy Trinity. The Trinity may seem remote and abstract but each Christian baptized "in the name of the Father and of the Son and of the Holy Spirit" is claimed for Christ by the Church: our souls branded, indelibly tattooed with the triune life of God. Baptism marks us as daughters and sons of God, sisters and brothers of Christ, drawn by the Spirit to worship the Father of us all. Be good stewards of the earth and its resources. Catholic High School Goes Green! I read an uplifting article in New York Newsday titled, Kellenberg To Expand Its Solar System (6/14/11) by Nicholas Spangler which tells how Kellenberg Catholic High School in Uniondale, Long Island, NY will be expanding a program that they've had in place for two years. Beginning in September, "there will be many more of those tubes: 3,450 to be precise, facing south at a 45 degree angle to catch the sun's rays. In colder months, the tubes will help heat the school's water and warm its classrooms; in summer, they will help cool them down.....An official from the NYS Energy Research and Development Authority, Dale Zatlin, said she believed it would be the first 'solar thermal' system in the state that both heats and cools. What great news! Kellenberg is a well respected school, with a fantastic reputation. I know a teacher who works there and the students are truly remarkable. I've been to events there on the weekends, when students are willingly giving time to serve and help out. It's that kind of school. And now this terrific news that they're trying to go green, by harnessing the sun's energy while saving money too. The project is being led by Brother Gary Eck, a Kellenberg math teacher, who was quoted as saying, "Renewable energy has benefits beyond dollars and cents. We are participating in God's creative activity. Using energy well is part of that." I hope this creative and innovative idea catches on in other schools around the country. It's greatly needed. It's a practical way to use a renewable energy source while following the Church's mandate to be good stewards of the earth and its resources. Did you ever try forgiveness, real forgiveness? 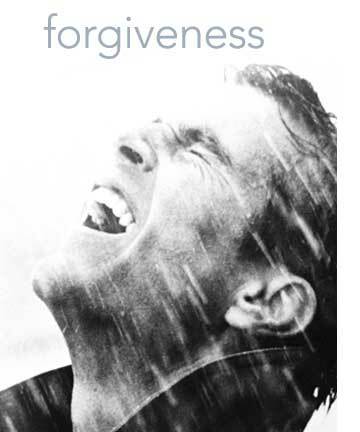 Last week in our Communtiy liturgy our homilest spent some time fleshing out his ideas on forgiveness. It is not an easy thing. But it is essential in all committed relationships. It is a pre-requisite for community living. As we get older, we can even trim our spiritual vocabulary down to just three words: Forgive, forgive, forgive! That's really what it is all about. It is all about forgiveness. To die with a forgiving heart is the ultimate. We shouldn't delude ourselves on this. Everything in the world does little for us if our hearts are bitter and incapable of forgiveness. But it’s not easy to forgive. Most everything inside of us protests. When we have been wronged, when we have suffered an injustice, when someone or something has treated us unfairly, thousands of physical and psychological mechanisms inside of us begin to clam-up, to shut-down, to freeze- over, to self-protect, and to scream-out in protest, anger, and rage. Forgiveness is not something we can just wish and make happen. The heart, as Pascal once said, has its reasons. It also has its rhythms, its paranoia, its cold bitter spots, and its need to seal itself off from whatever has wounded it. And finally, all of us have been wounded. No one comes to adulthood with his or her heart fully intact. In ways small or traumatic, we have all been treated unjustly, violated, hurt, ignored, not properly honored, and unfairly cast aside. We all carry wounds and, with those wounds, we all carry some angers, some bitterness, and some areas within which we have not forgiven. During our Pentecost celebration this past week we hosted many Marianist volunteers at our liturgy and brunch. The volunteers consisted of so many generous and helpful people. They have assisted us each week doing countless tasks. Whether it is cleaning the Emmanuel Retreat House, sorting through books in the Library, organizing Parents Club activtities, organizing the Alumni Parents, creating order at school events as security or countless other tasks, these volunteers offer us support and generous service. 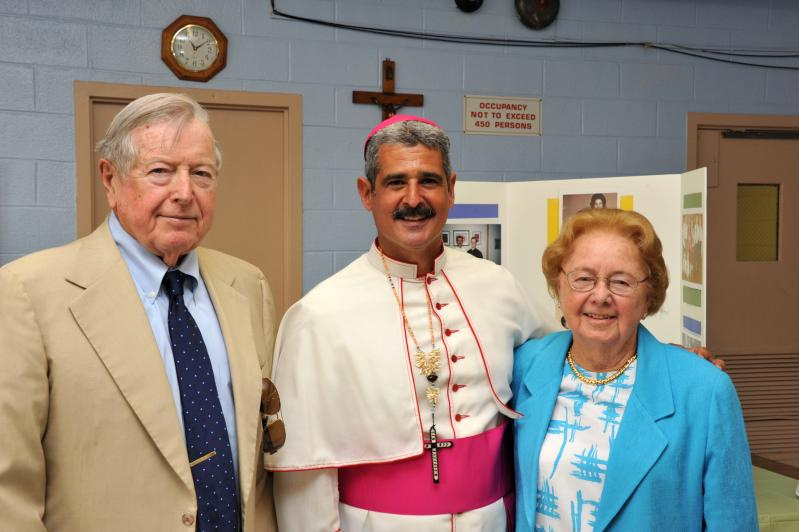 They are truly an integral part of the Marianist family. In our Pentecost liturgy, Father Albert quoted Henri Nouwen who once said: "By touching the center of our solitude, we sense that we have been touched by loving hands." Father Albert continued in his homily, "Deep inside each of us, like a brand, there is a place where God has touched, caressed, and kissed us. Long before memory, long before we ever remember touching or loving or kissing anyone or anything, or being touched by anything or anybody in this world, there is a different kind of memory, the memory of being gently touched by loving hands. When our ear is pressed to God's heart - to the breast of all that is good, true, and beautiful - we hear a certain heartbeat and we remember, remember in some inchoate place, at a level beyond thought, that we were once gently kissed by God." This is truly what is deepest within each one of us. He reminded us that we were once touched by hands far gentler and more loving than our own. The memory of that touch is a brand - warm, dark, gentle. To enter that memory is to lean on the breast of Christ, just as the beloved John, the Apostle, did at the last supper. From that place, with our ear on Christ's heart, we have the truest perspective on our world. On Pentecost Sunday, we prayed that we not fear the life the Spirit offers us. with the fire and power of your gifts. come enlighten my mind and my will. all that God has revealed. brand my mind and my heart with God's Word. for judgments both prudent and pure. to do what is right, what is just. to humble myself before God. and draw me to reverence and prayer. and my soul with the breath of your peace. through my, Savior, my Lord Jesus Christ. Here is a great new vocations video made in 2011 for the English Dominican Province. The Order of Friars Preachers is an international religious order of priests and brothers in the Catholic Church. The Order was founded in 1216 by St Dominic, with a mission for 'preaching and the salvation of souls'. The friars live together in communities called priories, bound together by vow and observing the evangelical counsels of poverty, chastity, and obedience. Members of the Order are known around the world as 'Dominicans' after their founder. In Great Britain, Dominican friars became known in mediæval times as 'black friars' because of the black cappa or cloak which they wear over their white habits. By the grace of the Holy Spirit, may it bear fruit in moving many to consider if they too are called to join in the mission of preaching for the salvation of souls. Here's a marvellous medley of Holy Spirit songs beginning and ending with the Gregorian Chant, Veni, Creator Spiritus. Let us pray for the Spirit's gifts. 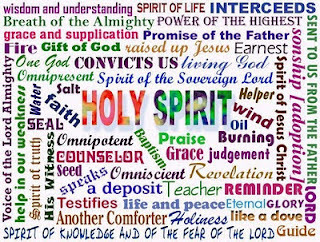 May the Holy Spirit empower us with wisdom, knowledge and truth that we might discern God's will in our lives. May the same Spirit give us the courage and humility we need to do God's will rather than our own. May the Spirit conform our minds and hearts to the Word of Christ and the desires of his heart. 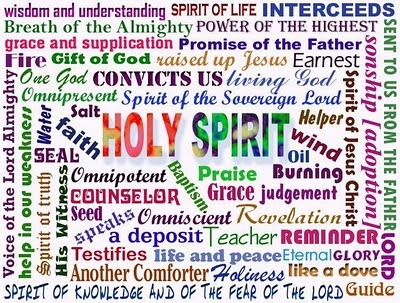 As we approach the Solemnity of Pentecost we realize that the Holy Spirit is about speech. In the Creed we say of the Holy Spirit that 'he has spoken through the prophets' and we read that the Spirit of the Lord fell on the disciples ... Jesus taught his disciples that they were not to worry about what they should say when called to bear witness to their faith, for the Spirit would give them the words they needed. We read that the gift of speech was given to the disciples so that each person listening heard them in his own dialect telling about the mighty works of God. So the Holy Spirit is about speech. The Spirit is about speech and depth, and so He builds a new community. He establishes communities established on speech. St Thomas Aquinas says 'communication makes the city.' Community building are largely about this: getting people to talk, finding words on which people can agree, creating structures so relationships hold it together. When preparing for or celebrating Pentecost this weekend, listen to the musical selection below for some Music for Pentecost. 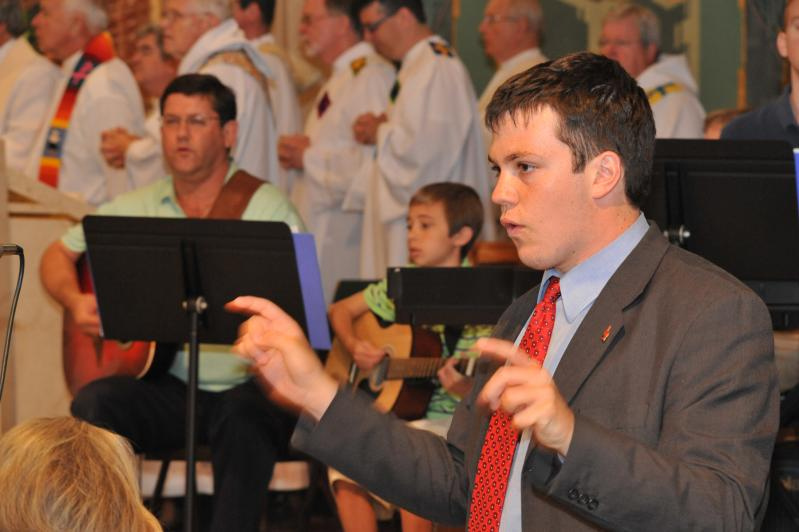 Some parishes encourage folks to wear a little red on Pentecost (the liturgical color of the day and a reminder of the tongues of fire that came to rest over the heads of believers on this day. Send forth your spirit, Lord, and they shall be created. 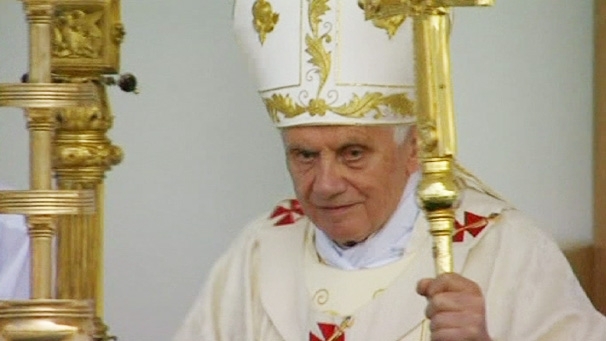 Pope Benedict warned Sunday that the traditional family in Europe was "disintegrating" under the weight of secularization and called for laws to help cope with the costs of having and educating children. "Unfortunately, we are forced to acknowledge the spread of a secularization which leads to the exclusion of God from life and the increasing disintegration of the family, especially in Europe," he said in his sermon on the edge of the capital. He continued, "Freedom without commitment to the truth is made into an absolute, and individual well-being through the consumption of material goods and transient experiences is cultivated as an ideal, obscuring the quality of interpersonal relations and deeper human values; love is reduced to sentimental emotion and to the gratification of instinctive impulses, without a commitment to build lasting bonds of reciprocal belonging and without openness to life. We are called to oppose such a mentality! Alongside what the Church says, the testimony and commitment of the Christian family - your concrete testimony - is very important, especially when you affirm the inviolability of human life from conception until natural death, the singular and irreplaceable value of the family founded upon matrimony and the need for legislation which supports families in the task of giving birth to children and educating them. Dear families, be courageous! Do not give in to that secularized mentality which proposes living together as a preparation, or even a substitute for marriage! Show by the witness of your lives that it is possible, like Christ, to love without reserve, and do not be afraid to make a commitment to another person! " 1. Find something that you are really passionate about. This gives you a strong sense of purpose and it is a big part of happiness. To do that, you need to be honest with yourself, observant, and make the most out of a situation. 2. Find the smartest people you can and surround yourself with them. You will be challenged to do your best and they would elevate your thinking. Smart people will challenge you to think harder and in entirely different ways. Search criticism to become a better self. 3. Find allies rather than adorers. You can choose to surround yourself with adorers who are easy to be around but never tell you when you screw up. Instead, seek out allies who are honest with you when you feel you are not living up to your potential; people who challenge you to be the best you can be. 4. Find the courage to do things you are not ready to do. Marissa lists as examples four things that she was not ready for (the move from WI to go to college 2,000 miles away, choosing a major that few people would Know what it means, go to Switzerland for a summer and, in 99, choose to work for a start up with 8 employee and a ridiculous name). Doing something you are not ready to do isn't comfortable. But in pushing through this discomfort you will learn a lot more about yourself. You learn you can do something you did not think you could do, or you'll learn where you're limits are. Either is valuable. It's important to push through that uneasiness because that's how you really grow and you really reach. 5. Find places where you're comfortable with. Marissa feels in her element at Google surrounded by people who are just like her and who share the same interests. Passion becomes an amazing neutralizing force for the fear or uneasiness one might usually feel. 6. You can help others find things. Be an information fountain. Power comes from sharing information. Sharing leads to connection, connection leads to collaboration, collaboration leads to creativity and innovation. Marrissa Mayers, VP at Google Inc.
“For all that has been – THANKS! Yesterday the two Marianist high schools celebrated their Baccalaureate Mass in the morning. In the afternoon, over 800 students graduated from our two schools with the usual pomp and circumstance that accompanies a high school graduation. So many faculty, students, parents, and others gave of their time and effort to make this day successful. We are grateful for the spirit of the gifts because these are gifts that not only raised our spirits, but also raised the day. For past and present gifts, we are deeply grateful. For new gifts, we are hopeful. And so we give thanks for so many things. It is just fitting that we give thanks to almighty God for all. The psalmist speaks boldly of gratefulness. their message, to the ends of the world. its course runs through to the other; nothing escapes its heat. By them your servant is instructed; obeying them brings much reward. Who can detect heedless failings? Cleanse me from my unknown faults. But from willful sins keep your servant; let them never control me. Then shall I be blameless, innocent of grave sin. keep the thoughts of my heart before you, LORD, my rock and my redeemer. The Scriptures cry out to us: trust and pray. Trust in God’s generosity and mercy. And in the midst of our darkness, pray for light. The disciples could never have imagined what was to come – or the astounding all that would unfold: the millions of lives that would be changed across thousands of years. How that moment of grace called Pentecost would come upon them like tongues of flame and ignite a revolution. The churches that would be built, the universities that would be erected, the hospitals and missions and charities that would fan across the world in the name of Christ the Lord. We are a part of that. But in those mysterious days before Pentecost, the disciples knew that their future was clouded with doubt and mystery. And all they could do was pray. That is the great legacy, and lesson, of the Sunday between Ascension and Pentecost. It comes down to just one word: pray. Significantly, the disciples didn’t just practice prayer alone. They also did it in community. They turned to others for help and support. Our great communication with God – our ongoing conversation with Him – happens both singularly, and collectively. Communication also happens in community; we are the Body of Christ, and that means we are, together, not only his hands and his feet. We are also his voice — to one another, and to the world. As the disciples understood – sometimes the greatest hope is unseen. But trust in this: no matter how deep the darkness, the light we crave will come. The disciples in the upper room did. And they ended up setting the world ablaze. Father Michael Scanlon speaks about his vocation. Decisions great and small are ordeals in life. It seems God wants to be more of a factor in our decision-making processes. Fr. Michael Scanlon breaks down the decision-making process and offers the wisdom on how God communicates to us His will in our decision making through our feelings, signs, circumstances, prayer, etc. Read his insights on discernment. "It was the experience of God calling. I experienced it first while at Williams College in Massachusetts. One of my roommates was [the late owner of the New York Yankees] George Steinbrenner. I was receiving some very confusing teachings in philosophy, so one day I went out and spent a whole day and night in the woods. There, I heard God saying to me, “You can trust the Catholic Church as a truth-telling institution.” After that, I read everything I could find. I went to the New York Public Library reference librarian, and he gave me all kinds of great reading material from John Henry Newman and G.K. Chesterton. Before I knew it, I was elected the president of the Newman Club, and I was on the way, with a great sense that God would lead my life. I thought my life was set. I was in ROTC and was supposed to go into the Air Force. I was engaged to be married. The night before I was to report for duty, while at my fiancée’s, I got a call not to report for duty. Congress had cut the budget, and I was told to stand by. Once I said “Yes” to that, I had a sense of the presence of God. I ended up being called to the military afterwards. I was serving as a judge advocate in the Air Force and had a job waiting for me on Wall Street. The day I passed the military bar and became fully qualified, I sensed God saying, “Be a priest in community.” I said “Okay” and began pursuing that. I visited the Jesuits and the Dominicans, but it was when I visited the Franciscans that I felt at home and at peace. I joined up and never questioned it." The digital world of social media offers great potential for those hoping to spread the Gospel message. Pope Benedict XVI approves of social media and its enormous potential. With the click of a button Christians can reach millions of believers and non-believers alike with the message of the Gospel and the call to follow the Lord. "Church communities have always used the modern media for fostering communication, engagement with society, and, increasingly, for encouraging dialogue at a wider level. 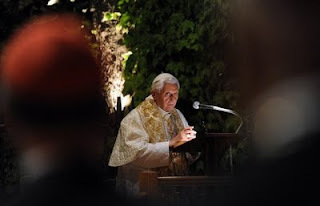 Yet the recent, explosive growth and greater social impact of these media make them all the more important for a fruitful priestly ministry," Pope Benedict said in his January message for the 44th World Day of Communications. Salvatore Dalí said that his inspiration for The Ascension of Christ came from a "cosmic dream" that he had in 1950, some eight years before the painting was completed. 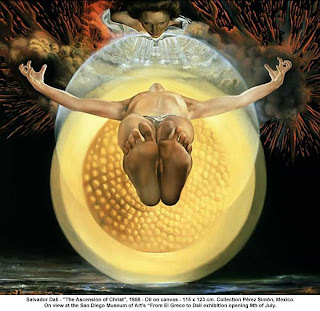 In the dream, which was in vivid color, he saw the nucleus of an atom, which we see in the background of the painting; Dalí later realized that this nucleus was the true representation of the unifying spirit of Christ. The feet of Christ point out at the viewer, drawing the eye inwards along his body to the center of the atom behind him. The atom has the same interior structure as the head of a sunflower. As with most of Dalí's other paintings of Christ, his face is not visible. Above the Christ is Gala, her eyes wet with tears. The figure of the Christ, from his feet in the foreground to his outstretched arms, forms a triangle. The Preface for the Ascension offers a theological summary of what the Church celebrates on this 40th day after Easter. Pray the prayer before you celebrate the solemnity and focus on those verbs. Father, all-powerful and ever-living God, we do well always and everywhere to give you thanks and praise. Today the Lord Jesus, the king of glory, the conqueror of sin and death, ascended to heaven while the angels sang his praises. Christ, the mediator between God and humankind, judge of the world and Lord of all, has passed beyond our sight, not to abandon us but to be our hope. Christ is the beginning, the head of the Church; where he has gone, we hope to follow. The joy of the resurrection and ascension renews the whole world, while the choirs of heaven sing for ever to your glory: Holy, holy, holy Lord, God of power and might, heaven and earth are full of your glory. Hosanna in the highest. Blessed is he who comes in the name of the Lord. Hosanna in the highest. Virgin of Hope:pray for us! Yesterday the Holy Father ended Rome's observance of Mary's month with the traditional visit to the Lourdes grotto in the Vatican gardens.